As I mentioned yesterday, after I did my swatches of the Zoya Beach and Zoya Surf colors, I did some playing around with them and my dotting tools, tape, and stamping stuff. The three pinks from the Beach side seemed to want to be together, so I did a base of Shelby (the lightest of the trio) and added dots with Lara (the darkest one) and Reagan (the medium one). 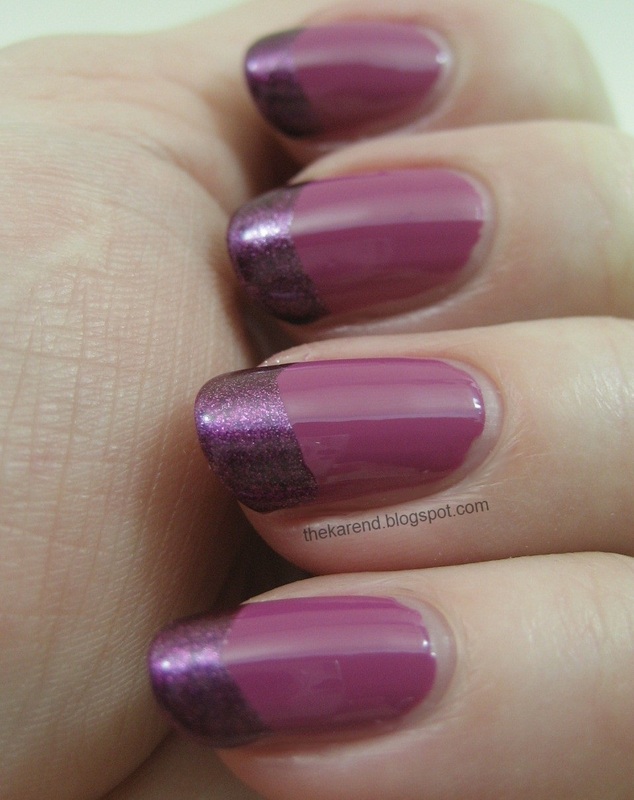 I put on Reagan, the purple-est polish from Beach, and added freehand tips with Carly, the purple from Surf. 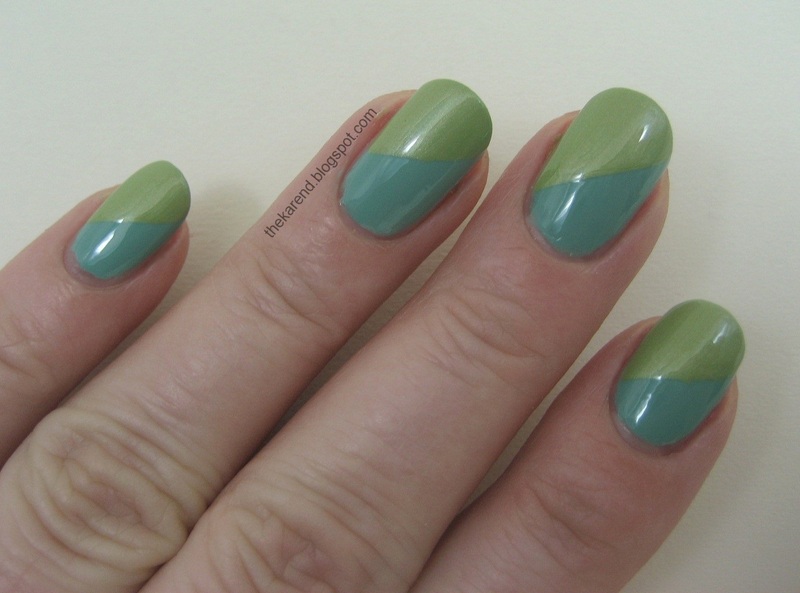 On the theory that all blues and greens go together (I may have made that up), I put on Wednesday, waited for it to dry, then taped off diagonal lines and put Tracie on the non-taped portions of my tips. Then I added Tracie dots on the Wednesday side and vice versa, which was fun to look at and also nicely distracted from the fact that my diagonals were not all the same angle. 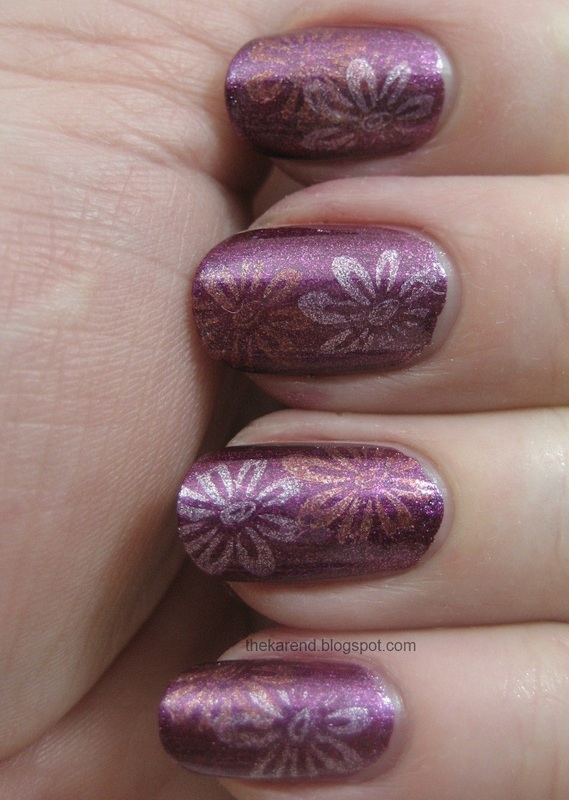 I've had good luck stamping with Zoya shimmers before, so decided to try a bit of that. I did a base of Tracie then stamped with Meg for a tone-on-tone look. The design is from Red Angel plate 107. I had to revisit pretty Carly, so I put on one coat of that plus a quick dry top coat, then stamped with Rory and Myrta using Salon Express plate 18. 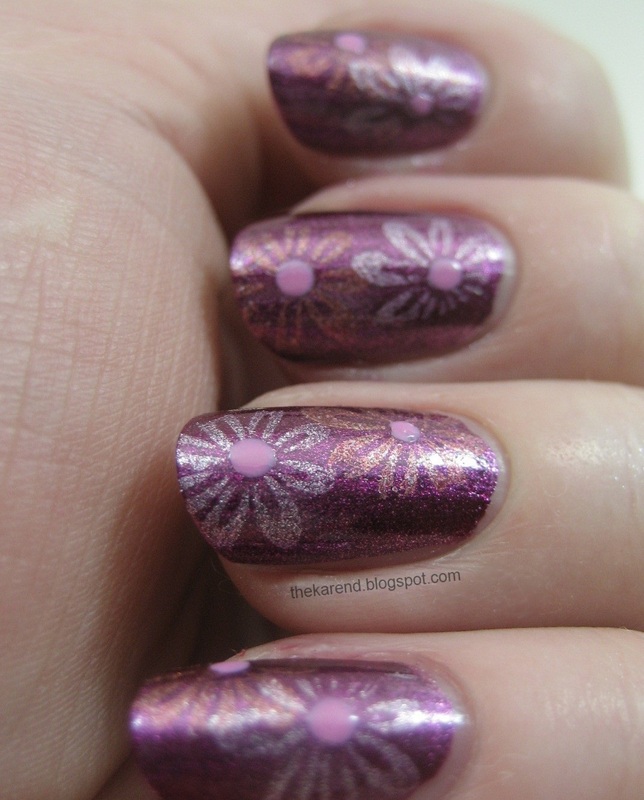 Finally, in the department of I should have left well enough alone, I added dots with Shelby in the center of the stamped flowers. This sort of thing always looks good when mrsrexy does it, but I don't have her skill. I think that next time I need to make the dots smaller and a different color; Arizona probably would have been a fine accent. If you've been thinking about getting some Zoya and are in the continental U.S., this weekend would be a great time to order, as the Zoya Earth Day Promo is back again. This year it's April 21 and 22, and you can get Zoya polish for 50% off and exchange old polishes you no longer want (Zoya will dispose of them in a proper manner). Some restrictions apply; follow the link to see all the details. OMG you have been busy! My fave 2 are the spots and the pic at the bottom. Fab. Wow Karen, when you play around you take it rather seriously ;) Great job! 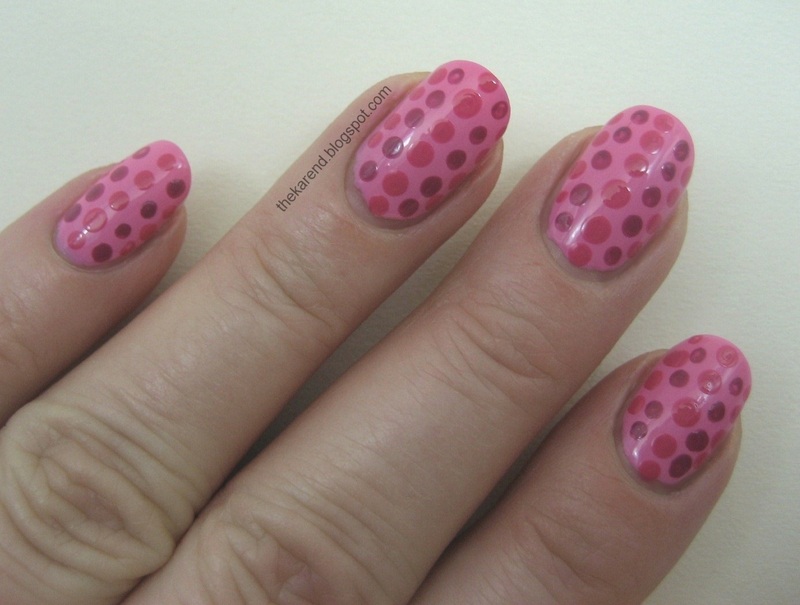 My faves are the polka dots manicure in pink and the blue/green before adding the dots! 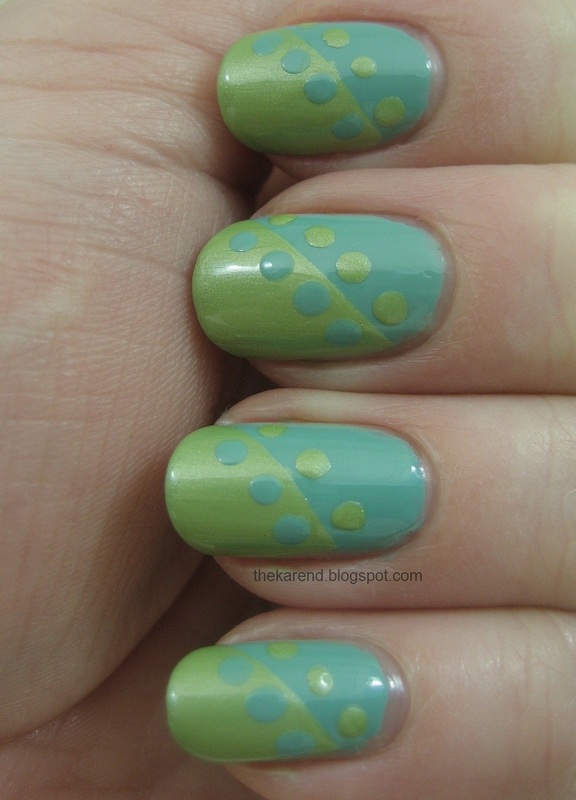 these are all awesome colour combos - Luv the blue and green with dots! I really love your blue/green diagonal. I usually buy every new Zoya collection as soon as it comes out, but somehow these two collections didn't strike me. It's good to know they stamp well though. I really like the dots! I agree with Maria above? Am I in the Twilight Zone? Is that nail art and stamping????? I am particularly loving the blue green combo! And I truly think you should embrace the nail art/stamping side of you. She's very good! I like them all but my very favourite is the diagonal one with the dot! I would have never told those two colours go so well together! My two faves are the dots...love both of them. Those dots are so creative! Love how they are both different...and the colours of both of them are really complimentary. all of these are smazing! my favorite is the purple with flowers! great job! I love the mani with Traci and Wednesday! So cute!! the stamps are my fave,,, good job!!! So many great nail art manis!! Love them all! All are so cute, I love the first one! Thats a lot going on, you must have been busy! These are all so cute Karen! How fun! 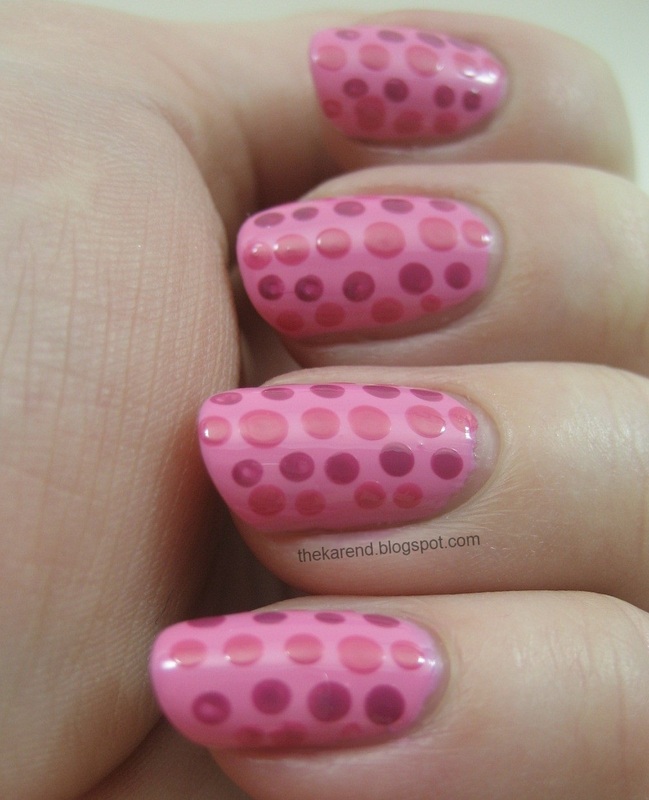 I especially love the first dots manicure! I have not had great success stamping with Zoya polish. :( Perhaps I am not using the right stamper and plates. What products do you recommend? This collection didn't really strike me (well aside from 1 or 2 of them) but I didn't realise how well they play together until you did all this wonderful art. When my Trade Secerts decides it time to get zoya collection in at a half decent time of the year I may pick up 4 (or 5)... Damn you!! lol jk! :) I love Traci and Wednesday together. Wow! Love all of these! I really love polka dots!! Its so good that I also saw this on Zoya FB. You go girl!! !